Have fun with Simon on one of our private wine tours in the Loire valley vineyards to discover and taste the remarkably diverse wines of this region of the loire valley. Loire Wine Tours specialises in visiting local vineyards, the small, family run, independent vignerons who are personally known to us and who make quality wine with the minimum of chemical interference. The loire wine tours are concentrated in the main Anjou, Saumur and Saumur Champigny appellations and are private and exclusive for a minimum of 2 and maximum of 4 guests. We offer a selection of wine tours from a half day tour to a four day wine tour. We offer Wine tours from Paris and Wine tours from London. 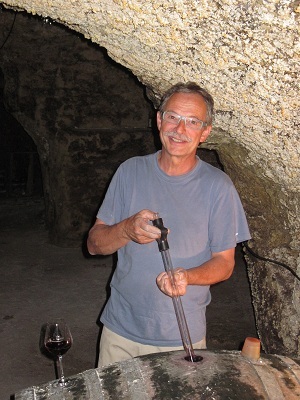 With Simon, you will meet the winemakers and experience their passion for their art and their pride in their wine. You will discover and taste the fine wines of this region of the Loire Valley. You will savour the sheer diversity of wine attributed to the patchwork of terrains which gives each wine a personality of its own. To enhance your experience, our lunches, when included, are often taken at a vineyard, not only with Simon, but also with the winemaker. A wonderful opportunity to share a relaxed lunch with and glimpse a little of the life of, a successful hard-working winemaker. Four day 'Uncork the Grape' Wine Tour. One day Wine Tour from Paris. Two Day Wine Tour from Paris. We may also be able to offer additional nights accommodation for those seeking to extend their stay at Manoir de Gourin. For those travelling from London we can arrange a tour to fit in with your arrival time in Angers. Please contact us for details.